The easiest way to upgrade your typical baked potatoes. 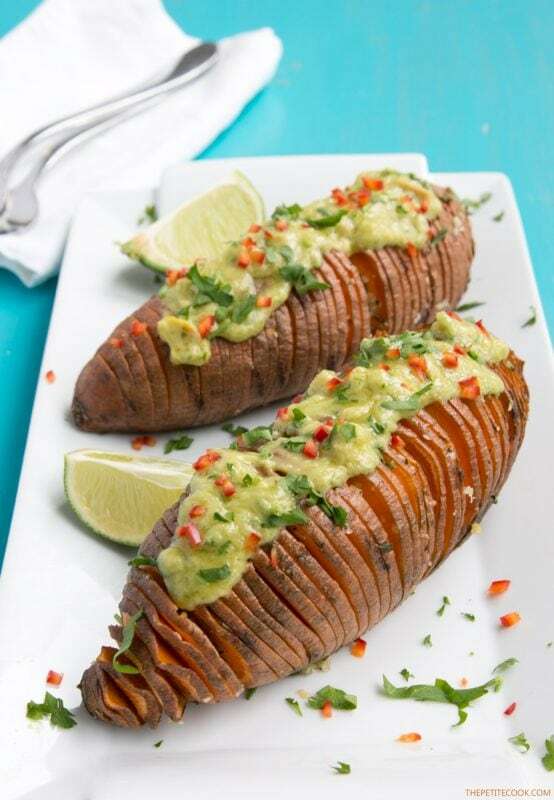 Crispy outside and fluffly melt-in-your mouth within, these Hasselback Sweet Potatoes with Guacamole make a great spring and summer side. I’m back with another recipe I make over and over again and never get tired of it. Hasselback Potatoes are by far my favorite potato dish, not only they’re fun to make, but don’t require any special knife skills. These tasty boys never fail to impress my guests, and with summer just around the corner, I’m pretty sure these Hasselback sweet potatoes will steal the show at any upcoming bbq or picnic. I mean, what’s not to love? 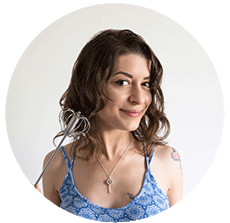 They’re incredibly cute, deliciously crispy on the edges and soft on the inside. They make a healthy and light meal on their own, but can be topped with anything you like! Making these Hasselback sweet potatoes couldn’t be easier. Start with a clean sweet potato or any kind of potato you have at hand. 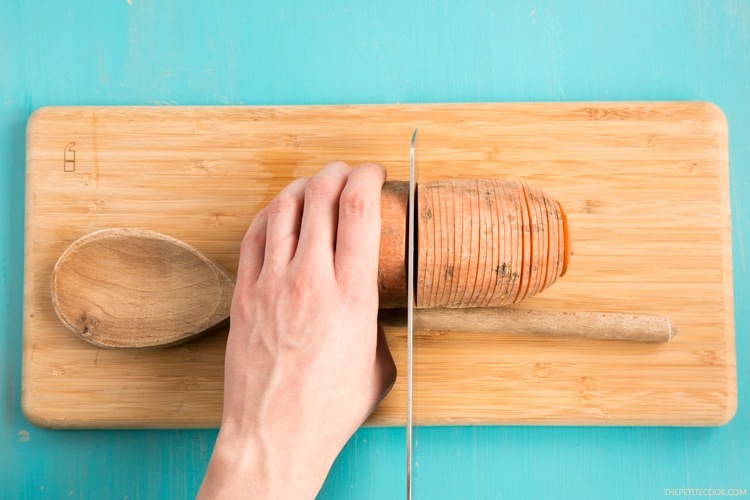 To ensure you won’t cut the potato all the way, rest a wooden spoon right next the potato. Slice straight down into the potato (making sure you don’t cut it all the way down) and keep going until you’re done. I like to slice my potatoes as thinly as I can, but any thickness will do. 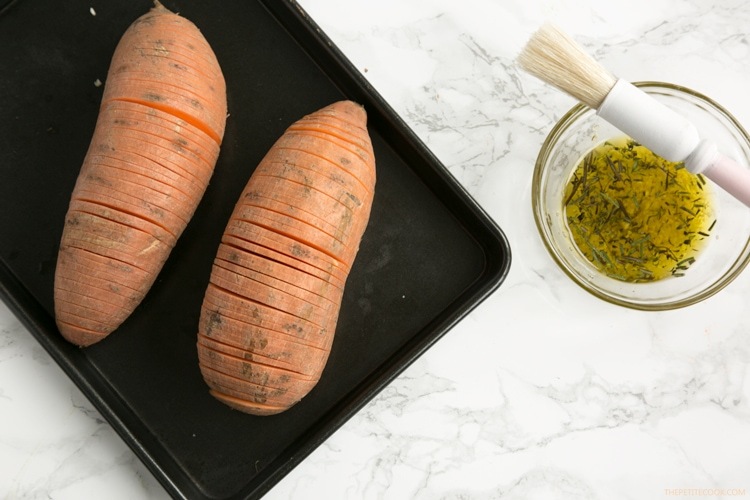 For plain Hasselback sweet potatoes you can stick with thyme as the seasoning, or use whichever herbs you might have on hand (rosemary, sage work great), sprinkle with sea salt and black pepper and finish by drizzling with a glug of olive oil. But if you ask me, sweet potatoes & guacamole are like Bonnie & Clyde. Badass and just meant to be together. 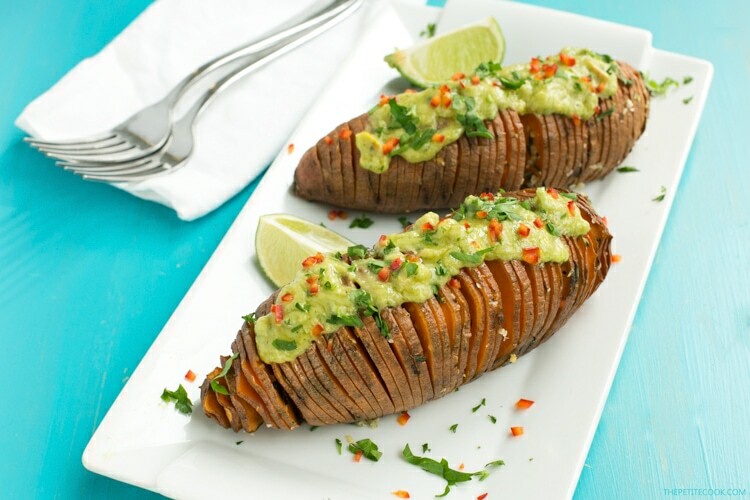 The vibrant and refreshing guacamole is slightly runny and it’s just the perfect topping for these Hasselback sweet potatoes. The recipe is super simple, involving only avocados, greek organic yogurt, diced onions, tomatoes, lime and chilli. 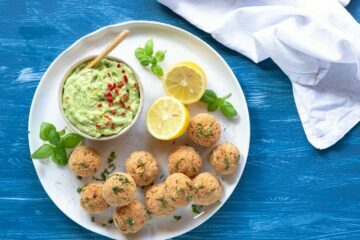 All you have to do is mashing the avocado with a fork, then mix in the rest of the ingredients, and it is super easy to throw together at the last minute. 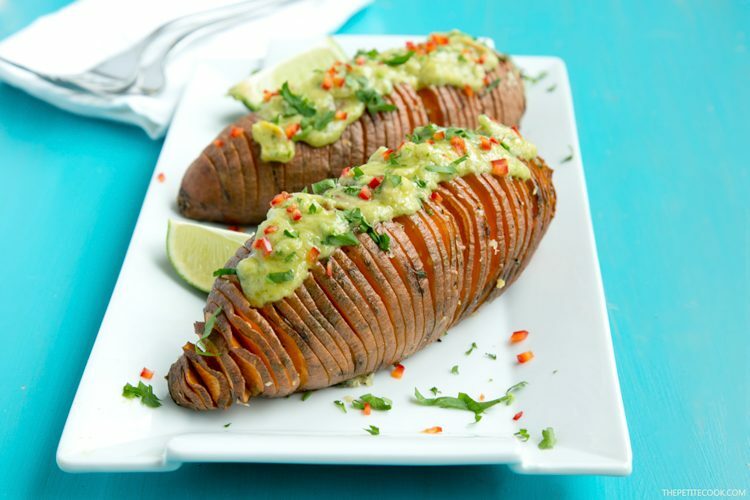 So, if you’re looking for an easy way to upgrade your typical baked potatoes, look no further- Turn them into these gorgeous Hasselback sweet potatoes and top with as much guacamole as you can! 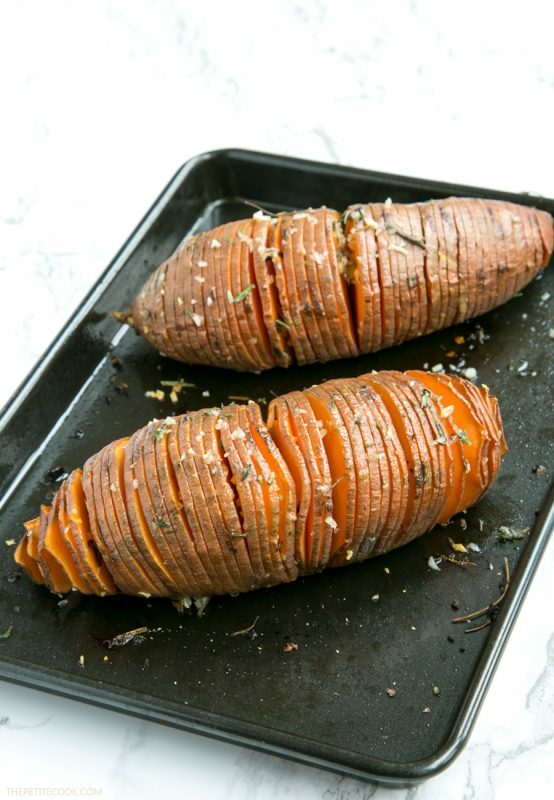 Hope you guys give these AWESOME Hasselback Sweet Potatoes a try. If you do, make sure to comment here below and share with me your favorite veggies to use. Don’t forget to snap a picture, tag it #thepetitecook and share it with me and all your friends on Instagram! Preheat the oven to 180C/ 375F. For the guacamole: put the avocados in a large bowl and mash very well with a fork. 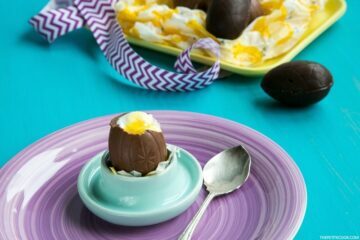 Slowly fold in yogurt and lime juice, and mix until you reach a creamy consistency. Add in chopped tomatoes & onion, coriander and chilli. Season to taste and refreigerate until ready to serve. For the Hasselback Potatoes: remove a tiny slice of flesh from the bottom so the potatoes sit flat on the cutting board. 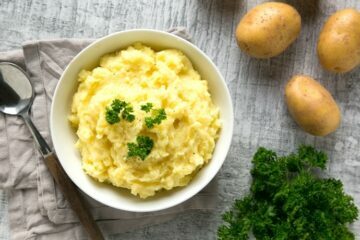 Place a wooden spoon on either side of the potatoes and, with the help of a sharp knife, slice all the way through the potatoes as thinly as you can, just until the knife blade hits the wooden spoon. Drizzle with olive oil and season well with sea salt and pepper, arrange on a baking tray and cover with foil. Bake for about 40 mins, then remove foil and drizzle with a glug of olive oil, and continue to cook for a further 10 mins, until the potatoes are crispy and cooked through. Top the sweet potatoes with guacamole and serve. Enjoy! To make it 100% vegan, substitute greek yogurt with a dairy-free alternative. There are no quantities for the yogurt and coriander. You mention adding lemon juice but the ingredients call for a lime. Could you clarify this. The recipe looks very good. Thank you so much Barbara for spotting my typos, the recipe is now updated 🙂 And I should definitely stop writing the recipes late in the evening! Thanks so much. I could have winged it but I would rather have the quantities that you use. It looks so good and healthy. Can’t wait to make it.